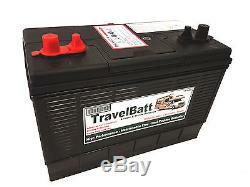 TravelBatt Leisure & Marine Batteries. Batteries are built to the very highest of specifications to cope with todays Leisure & Marine electrical demands. MotorHomes, Caravans & Boats are getting more complex with sophisticated Luxury that they requires premium performance Batteries to meet their high electrical demands. Brand promises the best performance and Long Life, no matter how harsh the conditions. TravelBatt Leisure & Marine battery range is designed with Advance Calcium Technology which makes them Maintenance Free and give Longer Life compare to conventional Leisure & Marine batteries. 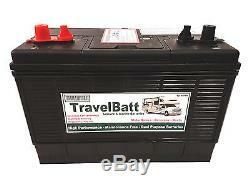 TravelBatt Leisure & Marine battery range is designed for both MotorHomes (Caravans) & Boats. These batteries are Dual Purpose Batteries as they are. Perfect for all types of leisure and marine Starting & Auxiliary use. 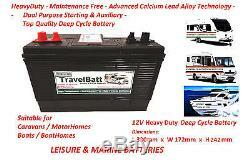 Leisure & Marine Battery with O.
Dual Purpose (Starting & Auxiliary) Deep Cycle Battery. Perfect for All types of Leisure & Marine Auxiliary Use. Maintenance Free with Advance Calcium Technology. Designed for all climates (This battery can withstand severe temperatures). POST LAYOUT [+ -] Positive on Left as in the Picture. Cold Cranking Amps: 800 A. Height: 242mm (Height is including Terminals / Posts). This is a high performance Wet Cell Flooded Lead Acid Battery with Advance Calcium+ alloy Technology. Battery case colour may differ depend on the stock which can be in Black or Grey colour. Please must use Continual Automatic chargers with these batteries such as NUMAX 12V 10A DC Fully Automatic Intelligent Connect & Forget Leisure Battery charger can be left attached to the battery for long periods and will look after your battery at correct state of charge until you need it next. Avoid completely discharging your battery (Below 10.5V) as this will reduce its cyclic lifespan. From time to time make sure the terminals are free from dust and dirt, and all connections are sound. Please must not use Trickle charge with these batteries. An equalizing charge for a 12volt battery required that it be charged with a voltage of at least 14.4 volts for a period of at least one hour once a month, or every 10 discharge cycles. An equalizing charge prevents battery stratification and reduces sulfation, the leading cause of battery failure. Reduced performance can also be an indicator that an equalizing charge is needed. Warning:-Remove bungs (plugs) immediately after receiving the battery or batteries (All types of flooded lead acid batteries) even in storage condition. Bungs (Plugs) are only for transportation use. If these instructions are not followed(removing bungs immediately) battery may get bulged or explode. INHALATION - Remove from exposure, rest and keep warm. EYE CONTACT - Wash out with plenty of water for at least 15 minutes. SKIN CONTACT - Remove contaminated clothing immediately and wash affected skin with plenty of water. INGESTION - If the electrolyte has been confined to the mouth give large quantities of water as mouth wash ensuring that it is NOT swallowed. If electrolyte has been swallowed, give water to drink immediately. BURNS - Apply sterile bandage. The item "12V 120AH (110AH) TB31MF HD Leisure Battery SPRITE STERLING SWIFT Xplore Compass" is in sale since Monday, May 15, 2017. This item is in the category "Vehicle Parts & Accessories\Motorhome Parts & Accessories\Caravan Parts\Mobile/ Touring Caravan Parts". The seller is "starterbatteries2011" and is located in Glasgow.